Albany Elementary School and Clinton County Middle School were awarded Showcasing the Arts grants from the Kentucky Arts Council. 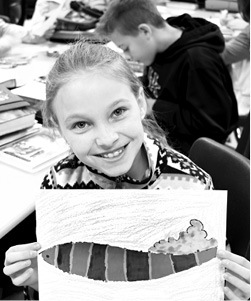 The Showcasing the Arts grant provides funds to assist Kentucky schools in offering students high quality performing and visual arts experiences in the school setting. 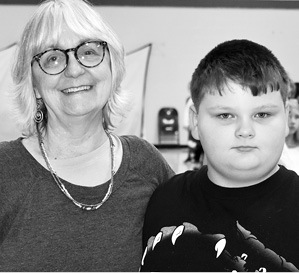 AES and CCMS utilized the funds to host Burkesville visual artist Patricia Ritter in two workshops with Mrs. Presley Sutton’s art students at CCMS and two workshops with the 3rd and 4 th grade students at AES on November 13, 2018. Students saw samples of Mrs. Ritter’s artwork, learned about the technical aspects of creating the pieces, reflected on the artwork, learned about careers in art, and created their own works of art. These workshops address several of the Kentucky Department of Education’s academic standards for arts and humanities, as well as demonstrators for the Visual and Performing Arts. Pictured here, students used their own creativity and imagination to finish an incomplete drawing created using only basic shapes and lines during the Showcasing the Arts program at AES and CCMS. Burkesville teaching artist Pat Ritter with 4th grade student Perry Neathery after the presentation at AES. Albany Elementary School student Summer Jones took a different approach with her drawing and turned it into a fish. 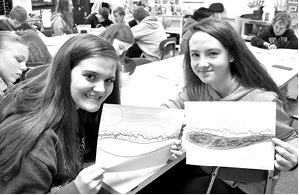 CCMS students Lexie Robbins and Emilee Owens show off their landscape drawings.